The massive civil engineering project to place part of Amsterdam’s ring road underground and expand the railway station at the Zuidas business district has run into major delays before any work has started, the Financieele Dagblad said on Thursday. A spokesman for the project said ‘more time is needed for a full and proper integrated design’ for the work. 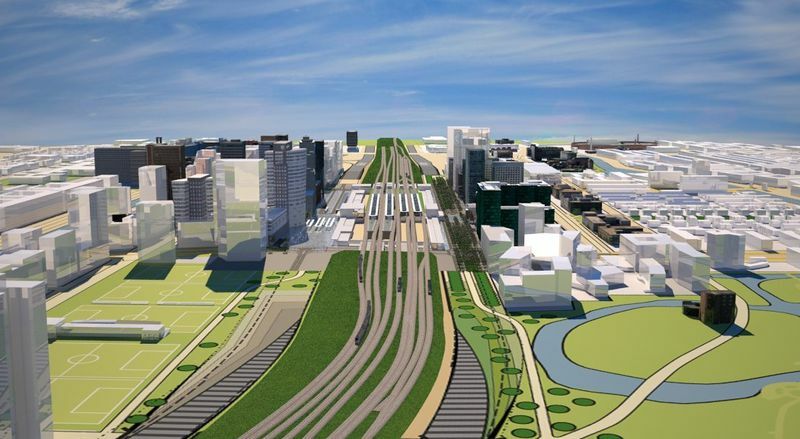 The complexity of the Zuidasdok plan, which was slated for completion in 2028, is one of the main reasons for the delay, the paper said. In particular, it is proving more difficult to ensure the ring road, one of the busiest stretches of road in the country, remains open while tunneling work is underway. ‘This project is taking place in a prestigious area with lots of high rise buildings and a demanding public,’ one source told the FD. The decision to expand Station Zuid with two more platforms is proving a further headache as it requires stronger foundations. The tunnel to connect both sides of Zuidas will also be made wider and there will be more shops and bike park facilities. This too is adding to the cost, the FD said. A consortium made up of Dutch construction group Heijmans, Fluor of the US and Hochtief of Germany won the preliminary contract for the €1bn project in 2017. The total cost of the project, due to be completed in 2028, has been put at nearly €2bn.